Having the correct commercial security in place is paramount to the effectiveness of your day to day operations. Bravo Three has serviced everything from 4 unit office complexes to 300+ acre storage facilities. We understand how to implement a security plan to properly secure your commercial property. No matter how small or large your property, a custom-tailored security solution provided by Bravo Three will benefit you. There are many variables to take into consideration when implementing a security plan for your commercial property. Our goal is to work with you to achieve the most cost-effective solution to meet your security needs. Knowing this, it is important for you to understand you do have options. Bravo Three can offer multiple solutions that will work with your budget. This includes a low-cost vehicle patrol, high-coverage standing guard, or any combination of the two. Read below to get an idea of the options Bravo Three can provide commercial security for you and your property. Commercial Vehicle Patrols are an extremely effective security service. Bravo Three currently provides these patrols for many satisfied clients in the San Diego County Area. This service is a proactive solution that deters criminal activity on commercial or industrial properties. It also can act as a reactive force such as call or alarm response. We can operate through a coordinated effort with your alarm monitoring service to respond to calls that would normally go without being serviced by local law enforcement. Get in touch and let us know if you’d like Bravo Three to come to your property and perform a free security consultation to come up with the perfect solution based on your budget and your needs. A standing guard is also a very effective solution for deterring the criminal activity in or around an industrial or commercial complex. The decision between a standing guard and a vehicle patrol is different for everyone, but ultimately comes down to cost effectiveness. Every situation is different, as is the security solution that will be applied to it. If you are interested in having a full-time dedicated security officer patrol your property, we would love to help. Bravo Three has standing guards on standby that are ready to serve you within 24 hours. 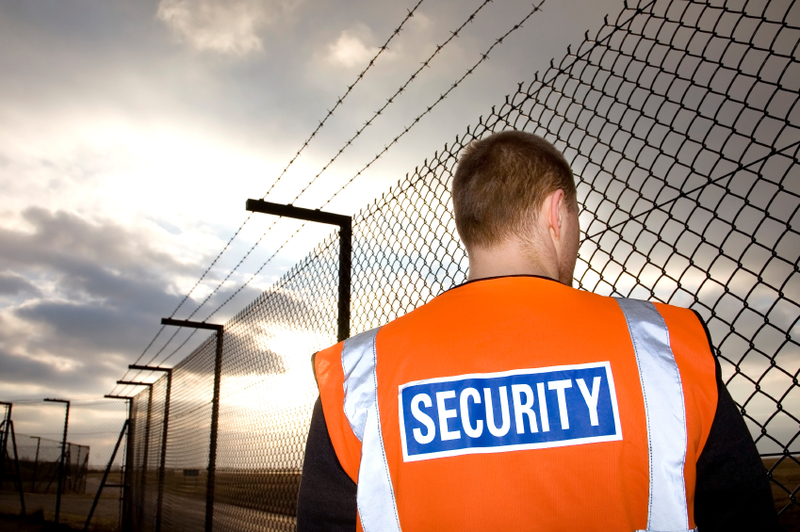 There are a number of important duties commercial security officers perform. Bravo Three understands these duties and knows how to implement proper strategies to ensure success. If you would like to discuss your unique situation with Bravo Three contact us today. Or, continue reading to learn about the many valuable ways Bravo Three protects your property. The most common use of commercial security is access control. For obvious reasons you don’t want just anyone driving on to your property. The difficulty is while you want to stop strangers from entering your property, you don’t want to annoy and slow down your everyday customers and employees. Our experienced managers and well-training officers will guard your access points with knowledgeable experience. Chances are, like most commercial properties, you have valuable assets on your property that could potentially be at risk of thief and vandalism. A physical check of your fences, walls, and barriers will help protect from large loss of stolen goods and prevent costly vandals from ever entering your property. It is all too common for homeless to seek refuge at a commercial location. They often come at night when your tenants and employees aren’t there. We see a great amount of damage and devaluing of commercial properties if the problem persists. Don’t let this happen to you. Bravo Three trains their guards to professionally rid your property of unwanted guests and restore your property to its original state. Property values can plummet if they are constantly seen with unwanted graffiti and gang tagging. Bravo Three has systems in place to report and help restore your commercial property. We will work closely with you to ensure proper measures are taken to prevent harmful tagging and promote rapid response to clean up the mess. It always seems that when concrete is poured someone will try and make their mark. And it’s not just concrete people target. It is often valuables they steal and the unfinished work they will tamper with. This can all be avoided by employing a temporary guard or posting your current guard more strategically. However you want to handle the situation, Bravo Three can help. Some commercial properties have employees coming and going at all hours of the day. Bravo Three security can be a comforting resource for late-night employees to get from their place of work safety to their car. It is just one thing we can do for you to help boost employee retention by creating a safe and desirable workplace. We can provide you a tailored commercial security solution.